From 15th to 25th February 2020. 19:00 Feast on Water - Rio de Cannaregio. 11:15 Carnival on boats of the Venetians. Departure Dogana da Mar in front of la Madonna della Salute Church, arrival half an hour lateur at Tre Archi Bridge on Cannaregio Canal. 14:30 Maries Celebration Parade - Departure from San Pietro di Castello Church, arrival Saint-Mark Square by Via Garibaldi and along Saint-Mark Basin. 11:00 The Best Masked Costume Contest Award Ceremony - Saint-Mark Square. 12:00 Angel Flight from Saint-Mark Square Bell Tower Campanile. 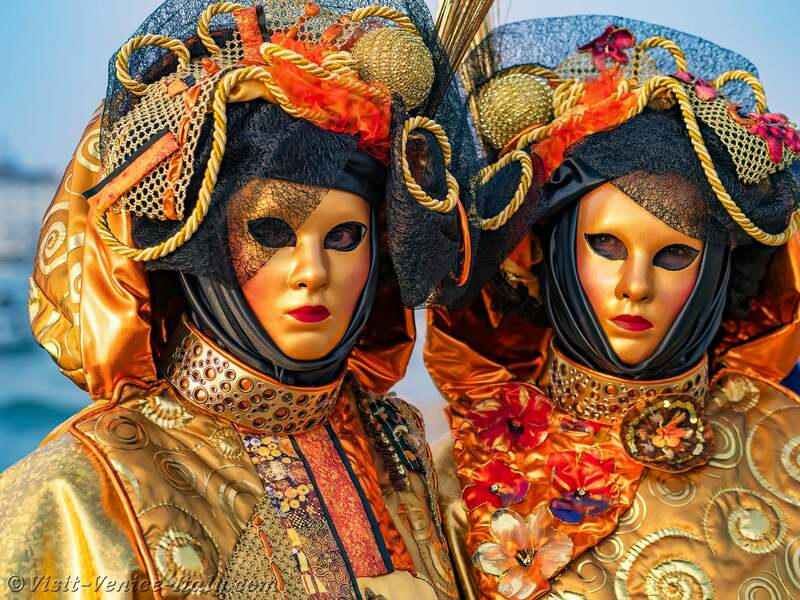 15:00 The Best Masked Costume Contest Award Ceremony - Saint-Mark Square. 15:30 The Best Masked Costume Contest Award Ceremony - Saint-Mark Square. 15:00 Burano's Carnival on the Burano Island. 11:00 Eagle Flight from Saint-Mark Square Bell Tower Campanile. 14:30 Grand Final Masked Costume Contest Award Ceremony - Saint-Mark Square. 11:00 Children's Best Masked Costume Contest Award Ceremony - Saint-Mark Square. 16:00 Award Celebration of the Marie 2019 - Saint-Mark Square. 17:00 Lion Flight from Saint-Mark Square Bell Tower Campanile.